History: (Marvel Vision#15 - Timeslip) - Years after Elektra was killed and her body burned in a church, a woman patterning herself after Elektra appeared in Japan. This new Elektra destroyed the Hand within a few days and the Japanese Yakuza within weeks. 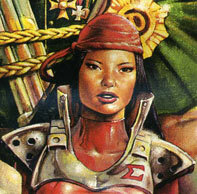 After their defeat, Elektra formed a new clan called the Sai on the Crimson Sun. She quickly drew the attention of every underworld assassin on the planet, many of which made attempts on her life. Days after each assassination, Elektra seemed to return anew with a different appearance, leading many to believe that while her appearance changed, the original Elektra was living on through the bodies of others. When questioned about Elektra, ex-S.H.I.E.L.D. 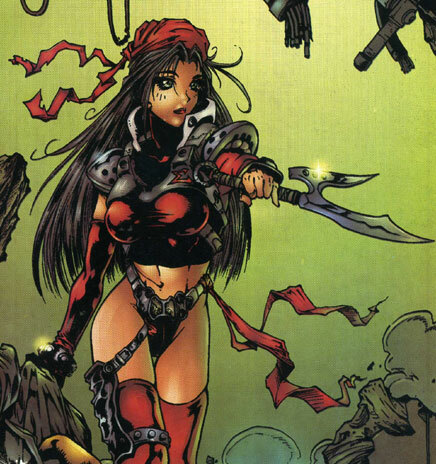 agent John Garrett claimed that the original Elektra was using ninja magic to switch bodies. Comments: Created by Jim Krueger and Kevin Lau. Elektra's reality diverged from Earth-616's Daredevil I#190, when the original Elektra apparently remained dead. It was very much possible that this Elektra was the original Elektra only in a different body but the story never came out and said it was. It mentioned that Garrett thought it was but it also pointed out that Garrett was known to be schizophrenic.